Jimmy Nelson pitched seven solid innings to lead the Milwaukee Brewers to a series opening 5-1 victory over the Cincinnati Reds at Great American Ballpark on Thursday night. Nelson allowed just five hits over seven innings with no walks and five strikeouts. In two starts this season, Nelson is 1-0 with a 1.38 ERA. The back end of the Brewers rotation has been very productive to start the season. Wily Peralta is 2-0 with a 2.45 ERA and Chase Anderson is 1-0 with a 0.69 ERA. 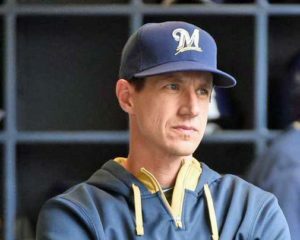 Just nine days before the season opener against Colorado at Miller Park and the Milwaukee Brewers are still looking to finalize the back end of their starting rotation. Left-hander Tommy Milone gave up seven runs and nine hits in 3 1/3 innings as the Brewers fell to the Cincinnati Reds 12-11. Milone has had a good spring and his hoping one bad outing won’t be a deciding factor in whether or not he makes the team or the rotation. Manny Pina homered in his fourth straight game. Eric Sogard tripled in a pair of runs and Ivan De Jesus Jr. raised his average to .405 with a 3 for 4 effort. The Brewers return to Cactus League action this afternoon against the Kansas City Royals. 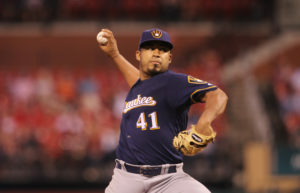 They’ll send Wily Peralta (0-0, 1.29) to the mound against Ian Kennedy. The Milwaukee Brewers signed free-agent left-hander Tommy Milone to a one-year deal on Wednesday. The 29-year-old Milone has pitched six years in the majors, the last two-plus for the Minnesota Twins. He went 3-5 with a 5.71 ERA for the Twins last season. Milone will be given a chance to contend for a spot at the back of the starting rotation, if not a spot in the bullpen. The Brewers finished last season with just one lefty (Brent Suter) on their roster. The Brewers have seven candidates (Jimmy Nelson, Zach Davies, Junior Guerra, Wily Peralta, Matt Garza, Chase Anderson and now Tommy Milone) for five starting spots. The Brewers have had inquiries from other teams concerning Guerra.